So I’ve had a few questions saying “who is this mystery team?” in response to the mention that not only were Café de Colombia mechanics stashing cocaine in their frames but a cycling team was a money laundering operation. I was only joking about my health, the team’s business is hardly a secret if I know about it. So who was this team? None other that Roslotto – ZG Mobili. It ran in 1996 and 1997. 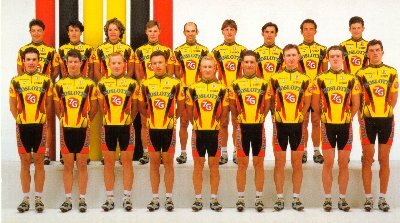 The team employed the likes of Paulo Savoldelli, Peter Van Petergem, Pascal Lino, Maurizio Fondriest and Piotr Ugrumov. It was a genuine team with decent riders, except the Russian sponsor, Roslotto, was a front operation for interests looking for an avenue into the European Union: spending millions on a team was great cover for getting money out of Russia and into Italy and the European banking system. Who’d notice a million roubles here, a million roubles there? No one in Russia knew how much it cost to run a cycling team, nobody in Italy was checking the inflows. …Crime in Russian sport internationalises as does the mafia itself. There are some indicators. The most flagrant was the Professional Italian cycling team Roslotto, which employed several riders from the Commonwealth of Independent States (CIS), and in which the main shareholder was the National Sports Fund of Russia (NSF), created by Minister of Sports Chamyl Tarpichev , a friend and tennis coach for Eltsine. His successor at the head of the NSF, Boris Fiodorov, publicly accused Tarpichev of links with the mafia and shortly thereafter was seriously wounded by a bullet and a knife in June 1996. At one time Roslotto gained a great deal of money from its sporting successes and its international trading with the NSF. Full article here. It’s eye-opening stuff, tales of assassinations and lots of money but that’s how sections of the Russian “economy” worked at the time, the cycling conduit was merely a clever avenue. Some had money that they wanted to get out of Russia and into Europe and its banking system, at the same time several Russian riders were prominent in the sport: two interests came together and everyone was happy. That doesn’t make it right. From what I gather people were paid their wages in full and the team operated as normal, the shady aspect had little or nothing to do with the riders and most of the team staff. Like all “front” operations, Roslotto’s team was semi-respectable, it was those operating in the background that had alternative aims. Fascinating. When did the identity of the sponsor come out?